This delicate herb with curly leaves is a member of the parsley family. Often used in French cooking, it has a subtle, mild taste with hints of liquorice. Chervil loses its flavour easily, especially if exposed to too much heat while cooking, so it should be added at the end of cooking or finely chopped and sprinkled over a finished dish. While easy to grow from seed, chervil requires cool, moist conditions. In hot weather or dry-soil areas, the herb will flower rather than produce lush leaves for culinary use. It’s therefore recommended that you plant it so it will grow in the cooler season. Alternatively, plant it in semi-shade or where it can be sheltered from the summer heat by other plants. With its delicate flavour, chervil is usually included in light recipes such as salads and soups, where it will not be overpowered by other flavours. In French cooking, it is commonly used in making a classic Béarnaise sauce. If unavailable, you can substitute with fresh parsley or tarragon, or a combination of the two, to reach a similar taste and fragrances as chervil. 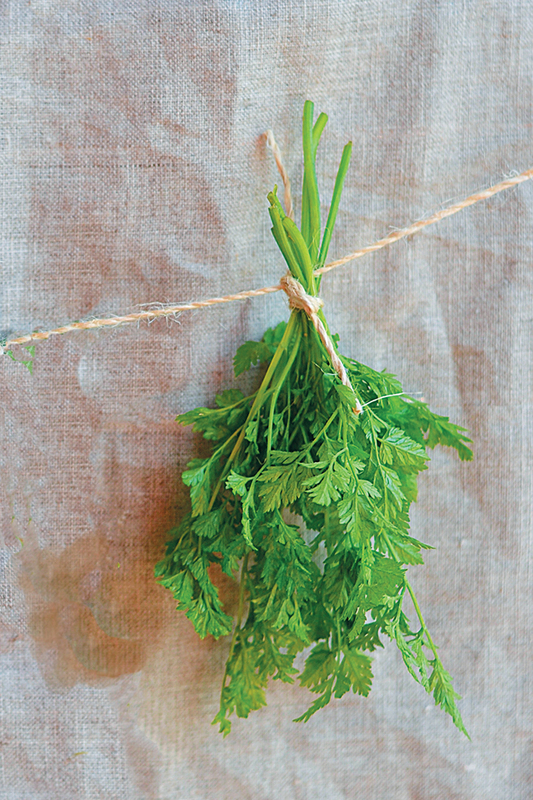 Chervil has strong anti-inflammatory properties, which make it a favourite in home remedies.